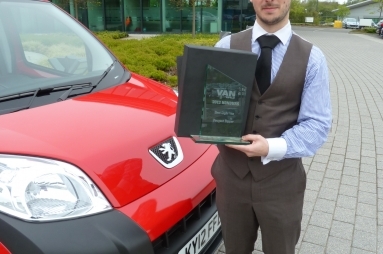 The Peugeot Bipper van, already an established and popular choice with prominent businesses and companies up and down the country, has again been awarded a key accolade, this time as the ‘Best Light Van’ - at this year’s Van Fleet World Honours. The highly contested ‘Manufacturer Awards’ are very sought after and the Peugeot Bipper’s compact proportions, frugal HDi diesel engines and transmissions (with manual, EGC and Stop & Start systems available), a payload of up to 660kg and a load volume of 2.5m3, make it a leading business choice. 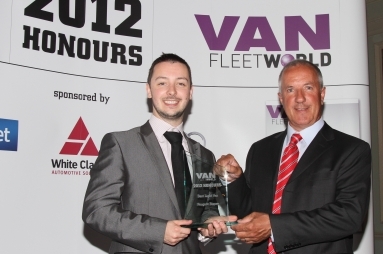 The Van Fleet World Honours are presented annually to those motor manufacturers, service companies and individuals who have, in the opinion of the judges, achieved the highest possible level of excellence in their sector. 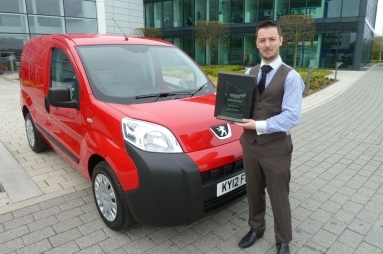 The Peugeot Bipper has won the Best Light Van 2012 Award at the Van Fleet World Honours. The trophy was presented at a special ceremony held at the Royal Automobile Club, Pall Mall. The awards are open to all motor manufacturers and the judging process combines the expert opinion of the Van Fleet World editorial team with the values provided by a number of leading leasing companies and fleet data providers. The Van Fleet World Honours judging panel is chaired by John Kendall, Editor of Van Fleet World, and includes Steve Moody, Alex Grant and Ross Durkin from the Fleet World editorial team. The great combination of superb HDi diesel engines and manual, EGC and Stop-Start transmissions, together with a potential 68.9mpg on combined cycle make the Bipper an ever-more popular choice for businesses throughout the UK. With a payload of 660kg and a load volume of up to 2.5m3, united with the high quality Peugeot fleet sales and support service and excellent product quality, the Peugeot Bipper is a superb light commercial van. The Bipper is also available in a popular ‘Professional’ version, featuring air conditioning, half-height bulkhead and Bluetooth as standard for businesses requiring even more comfort and support for their van drivers. Peugeot offers an extensive range of LCVs that includes the Bipper, the Partner, the Expert and the Boxer van. While the Bipper is nimble, compact and most economical, the durability and efficiency of design runs through the other vans. The Partner, Expert and Boxer are offered in a variety of wheelbases, capabilities and engine choices. Tim Zimmerman, Managing Director at Peugeot UK, said: “The Peugeot brand is reinvigorated – with a new logo, a its new brand signature - ‘Motion & Emotion’ and a portfolio of attractive new products – all capturing the identifiable strengths of the brand – being stylish, of high-quality, durable, affordable and efficient. Peugeot is part of the PSA Group – Europe’s 2nd largest automotive producer - and is one of the nine most popular automotive brands in the world, with sales of over 2m vehicles. Present in 160 countries with over 10,000 dealer-points. In 2010 the Peugeot brand celebrated its 200th anniversary. The Peugeot signature is ‘Motion & Emotion’. The UK is currently Peugeot’s 4th largest sales market outlet. Its UK subsidiary has its headquarters in Coventry and it has c240 franchised dealerships. The product portfolio includes electric (iOn), petrol and diesel cars (107 Compact, 207 its best-selling model (and in June replaced by new 208), the medium-sized 308, 3008 Crossover, 5008 Compact MPV, large 508 and the RCZ Sports Coupé). There are Diesel-electric hybrid vehicles with the 3008 HYbrid4, 508 Saloon HYbrid4 and 508 RXH. Also in the portfolio is MPV people carriers (‘Tepee’ range) and vans (Bipper, Partner, Expert & Boxer). Peugeot also has a ‘Mu by Peugeot’ mobility service - for the hire of all of its products, including cycles, scooters, cars, vans and accessories.